Today’s bwin money-back special centres around Real Madrid’s Gareth Bale, as the boys in black and yellow will refund selected scorer and correct-score bets if the Welsh winger grabs the first goal of the match when Los Blancos travel to Sevilla. Canny punters will be queuing up to lump on Cristiano Ronaldo – scorer of Real’s last three openers – at 5/2 to break the deadlock at the Ramon Sanchez Pizjuan Stadium, safe in the knowledge that their wager will be handed back if Bale beats him to the punch. There’s plenty of La Liga clashes for punters to tuck into, but we’ve pulled out the best bets from the three title challengers’ matches – which are all televised – to bring you a tasty treble that pays out at over 22/1. Sevilla may have only lost one of their last ten matches in all competitions, winning seven times during that run, but their home record against the best Spain has to offer this term has been atrocious. Atletico Madrid and Barcelona have beaten Los Nervionenses 3-1 and 4-1 respectively this season in Andalusia and a Real side that’s won eight of their last 11 in all competitions by at least two goals will have little to fear from Unai Emery’s men. The current La Liga leaders have got their act together of late, with six wins in their last eight matches following a three-game losing streak during February. They should find easy pickings when Granada visit the Vicente Calderon, as Lucas Alcaraz’s men have conceded seven goals over their last two away games and three or more in half of their 2014 road matches so far. 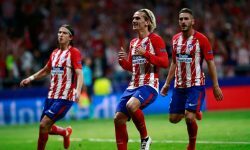 Atleti have brought up at least the treble in eight of their 15 La Liga home fixtures this term and look primed to do so again against a team hovering a point above the relegation zone. Los Blaugrana have rediscovered the habit of steamrolling sides on their own patch of late, with three-plus goal victories against seven Spanish opponents in Cataluna so far this year. However, their recent record at home to Celta is nothing fancy, as the Galicians have grabbed draws in four of their last eight visits to Barca HQ. Tata Martino’s side will win, but having gone in at the break level in four of their last seven matches in all comps they are taken to leave it rather late against a team that are rarely embarrassed at the Camp Nou.